Looks like hockey season is just around the corner! Put my skates back on for the first time since April and my surgery. Got to love to walk into a cold rink and being able to go on the ice again. I’m currently in Granada in Spain as a Goalie Mentor for the IIHF Goalie Development Camp. I’ve been here since Sunday and have been so busy, crazy! Sunday started off with a wonderful IIHF staff dinner with a view on the Alhambras, so pretty! The hard work started on Monday when we’ve been having meetings from morning till evening about the on-ice program and schedule and all logistics. In the evening, the goalie coaches arrived and we had a first quick meeting with them. 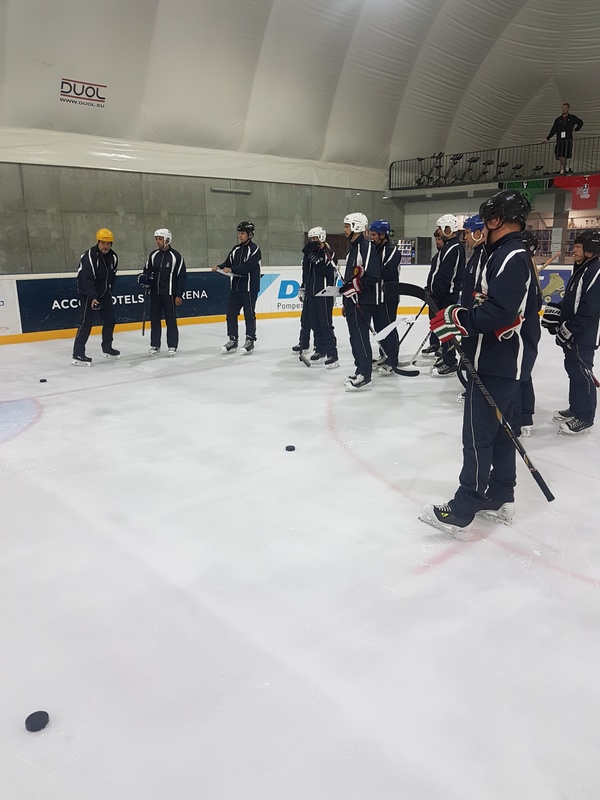 On Tuesday we went on the ice for 2 hours to go over the basic movements and discuss everything with the coaches! After the ice session we sat down with all the coaches for a debrief of what has been talked about on the ice. The afternoon and evening was filled with meetings where we would help the coaches come up with drills for practices, based on the focus of each practice. The focuses of the 6 ice sessions was predefined by us mentors. Wednesday started off exactly the same, meetings and ice sessions and the afternoon was filled with meetings to get to the final touches before the atheles arrive in the evening! At 6pm, all athletes were here and we had a opening ceremony where we would go over all logistical stuff and also a pannel discussion with Zuzana, Bri and me with some very interesting questions. Following the opening ceremony, we went to have dinner and a short sightseeing tour trough Granada before we came back to the rink for a camp group picture. With all that being done, it’s finally go time at the first IIHF Goalie Development Camp!